A high-order central essentially non-oscillatory (CENO) finite volume scheme combined with a block-based adaptive mesh refinement (AMR) algorithm is proposed for the solution of the ideal magnetohydrodynamics equations. The high-order CENO finite-volume scheme is implemented with fourth-order spatial accuracy within a flexible multi-block, body-fitted, hexahedral grid framework. An important feature of the high-order adaptive approach is that it allows for anisotropic refinement, which can lead to large computational savings when anisotropic flow features such as isolated propagating fronts and/or waves, shocks, shear surfaces, and current sheets are present in the flow. This approach is designed to handle complex multi-block grid configurations, including cubed-sphere grids, where some grid blocks may have degenerate edges or corners characterized by missing neighboring blocks. A procedure for building valid high-order reconstruction stencils, even at these degenerate block edges and corners, is proposed, taking into account anisotropic resolution changes in a systematic and general way. Furthermore, a non-uniform or heterogeneous block structure is used where the ghost cells of a block containing the solution content of neighboring blocks are stored directly at the resolution of the neighbors. A generalized Lagrange multiplier divergence correction technique is applied to achieve numerically divergence-free magnetic fields while preserving high-order accuracy on the anisotropic AMR grids. 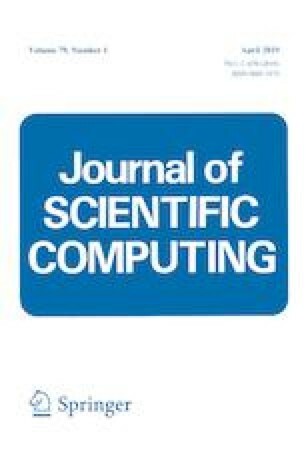 Parallel implementation and local grid adaptivity are achieved by using a hierarchical block-based domain partitioning strategy in which the connectivity and refinement history of grid blocks are tracked using a flexible binary tree data structure. Physics-based refinement criteria as well as the CENO smoothness indicator are both used for directing the mesh refinement. Numerical results, including solution-driven anisotropic refinement of cubed-sphere grids, are presented to demonstrate the accuracy and efficiency of the approach. This work was supported by the Canadian Space Agency and by the Natural Sciences and Engineering Research Council (NSERC) of Canada. In particular, the authors would like to acknowledge the financial support received from the Canadian Space Agency through the Geospace Observatory Canada program. Computational resources for performing all of the calculations reported herein were provided by the SciNet High Performance Computing Consortium at the University of Toronto and Compute/Calcul Canada through funding from the Canada Foundation for Innovation (CFI) and the Province of Ontario, Canada.